Fluffy blueberry pancakes on the table! These Birch Benders Blueberry pancakes are quickly becoming a family favorite. I've been working on creating vegan pancakes from scratch lately, but so far, every batch I've ever made has not worked out very well. I've tried flax seed "eggs" and mashed banana as a binder. Birch Benders Blueberry pancake mix uses all-natural ingredients: unbleached wheat flour, dried blueberries, potato and cassava starch. Just add water to make stacks and stacks! You just never know how a vegan recipe will work out. Sometimes things work well, like baking muffins and cupcakes with flax seed "eggs" and using nut milks in place of dairy milk. I don't miss butter much, as my favorite vegan "butter" is made of coconut oil and cashews (two of the best vegan baking replacements ever). But even with these wonderful and nourishing plant-based ingredients, recipes can fall apart. I've made many batches of vegan pancakes that didn't fluff up and didn't hold together. It takes a lot of experimenting! It's great to find a pancake (and waffle) mix that uses all-natural non GMO ingredients with a short ingredient list of things you recognize. Birch Benders makes this totally easy to do. My kids are all excited when they can mix up pancakes in the morning without my help. Plus, as a mom, I get to sleep in a little later on Sunday mornings when I place the Birch Benders mix out on the kitchen counter with the mixing bowl, spatula and all pancakes making essentials within reach. You know what else? My daughters bring me pancake breakfast in bed. That's weekend goals. In a bowl, mix the Blueberry Pancake mix and cinnamon together. Add sparkling water (or filtered water) to dry pancake mix. Mix everything together until the batter has a smooth consistency. Allow the batter to rest for about 10-15 minutes. As soon as bubbles form on the surface (after about 2-3 minutes), flip the pancake and cook until golden. 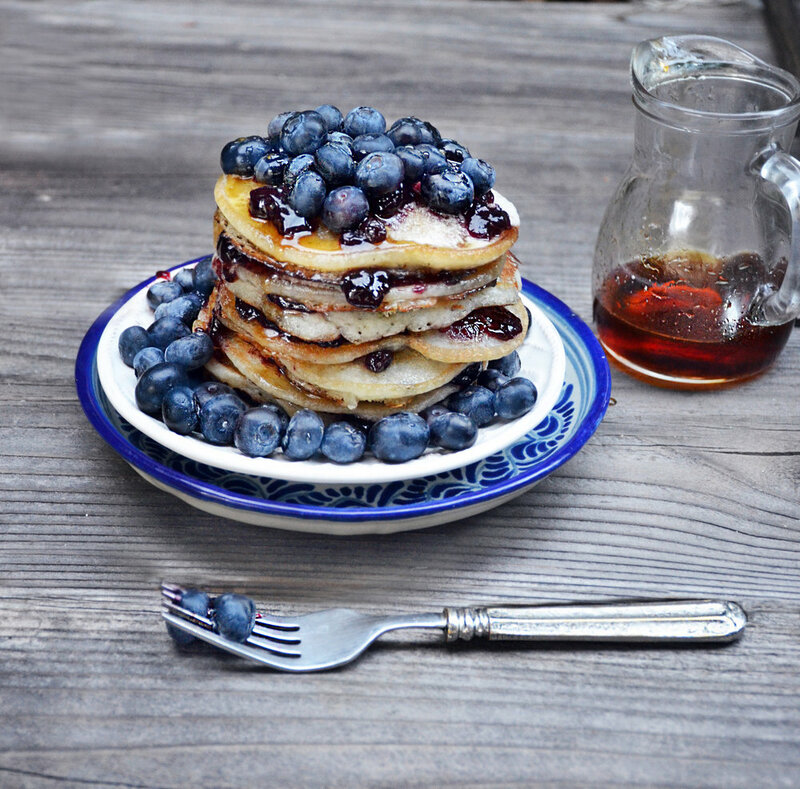 Serve pancakes with blueberry jam, blueberries and maple syrup.